16 S T A R T H E R E 2 0 1 8 DIRECT-TO-GARMENT their garage because these machines don't take up a lot of space. Most machines are at least 3´ x 3´ and they go up from there, he says. Along with the printer itself, companies need floor space to work on the front of it, loading shirts, and room to put a heat press. "You don't want the press too close to the printer. You want to have a few feet of space between the heater and printer. It creates heat and drives out the air, which then will potentially give you issues with, primarily, your white ink," Crocker says. "You want to give yourself enough space between the two to not have the heat press impact the environment around it." Screen printers, who already have access to a tunnel dryer, can forego buying a heat press, but shops that do not should buy a heat press with good pressure on it and make sure it is big enough to accommo- date the largest print size their printer can produce, he adds. DTG-printed shirts that come out of a tunnel dryer will have a different feel than shirts that were placed in a heat press. They will feel more like a screen printed shirt. Heat presses press the ink smooth. 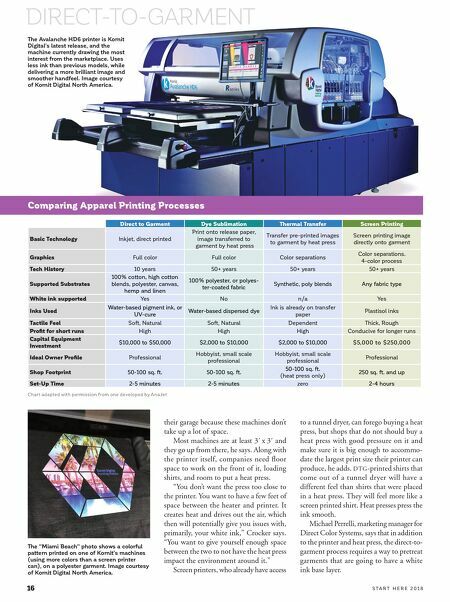 Michael Perrelli, marketing manager for Direct Color Systems, says that in addition to the printer and heat press, the direct-to- garment process requires a way to pretreat garments that are going to have a white ink base layer. Direct to Garment Dye Sublimation Thermal Transfer Screen Printing Basic Technology Inkjet, direct printed Print onto release paper, image transferred to garment by heat press Transfer pre-printed images to garment by heat press Screen printing image directly onto garment Graphics Full color Full color Color separations Color separations. 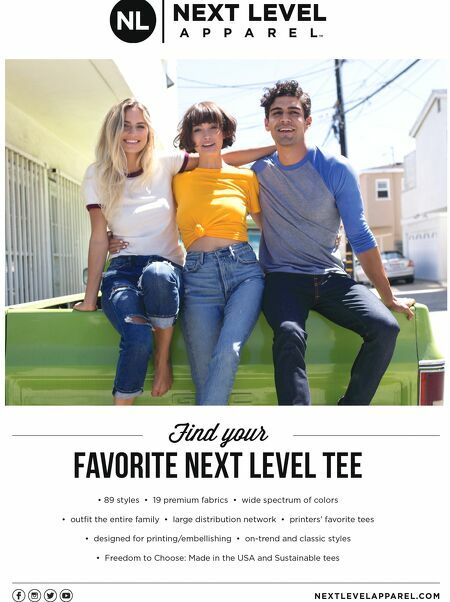 4-color process Tech History 10 years 50+ years 50+ years 50+ years Supported Substrates 100% cotton, high cotton blends, polyester, canvas, hemp and linen 100% polyester, or polyes- ter-coated fabric Synthetic, poly blends Any fabric type White ink supported Yes No n/a Yes Inks Used Water-based pigment ink, or UV-cure Water-based dispersed dye Ink is already on transfer paper Plastisol inks Tactile Feel Soft, Natural Soft, Natural Dependent Thick, Rough Profit for short runs High High High Conducive for longer runs Capital Equipment Investment $10,000 to $50,000 $2,000 to $10,000 $2,000 to $10,000 $5,000 to $250,000 Ideal Owner Profile Professional Hobbyist, small scale professional Hobbyist, small scale professional Professional Shop Footprint 50-100 sq. ft. 50-100 sq. ft. 50-100 sq. ft. (heat press only) 250 sq. ft. and up Set-Up Time 2-5 minutes 2-5 minutes zero 2-4 hours Chart adapted with permission from one developed by AnaJet The Avalanche HD6 printer is Kornit Digital's latest release, and the machine currently drawing the most interest from the marketplace. Uses less ink than previous models, while delivering a more brilliant image and smoother handfeel. Image courtesy of Kornit Digital North America. Comparing Apparel Printing Processes The "Miami Beach" photo shows a colorful pattern printed on one of Kornit's machines (using more colors than a screen printer can), on a polyester garment. Image courtesy of Kornit Digital North America.